University police began their investigation after a witness called 911 in reference to a suspicious person. The witness said he saw 10 people arguing and believed they had guns. The witness added, "the weapons resemble assault rifles." Multiple University of Florida football players face possible university discipline after an on-campus confrontation involving airsoft guns and lying to police. The confrontation occurred at the university's Keys Residential Complex on the evening of May 28. It involved several UF football players and a Gainesville-area gambler named Devante' Zachery - aka "Tay Bang" - and his friends, according to a UF police report obtained by First Coast News. The scene was captured on surveillance and cell phone video, the 17-page incident report states. The video shows "about 10–15 individuals, holding what appeared to be weapons,” according to the report. The report also says Lewis stopped associating with Zachery. According to Zachery’s interview with police, the issues “initially began with some joking around, but has since become more aggressive.” The only person that said Zachery was gambling, was Lewis, according to police. UPDATE: First Coast News spoke with Zachery by phone Thursday morning. Zachery claimed our report only told one side of the story, however when offered multiple times to share his side he did not. The football players initially denied having any involvement with the incident, according to the report. While searching for evidence, police didn’t find any bullets. However they did find a frying pan that, according to the report, was seen on camera being used by one of the athletes during the confrontation. 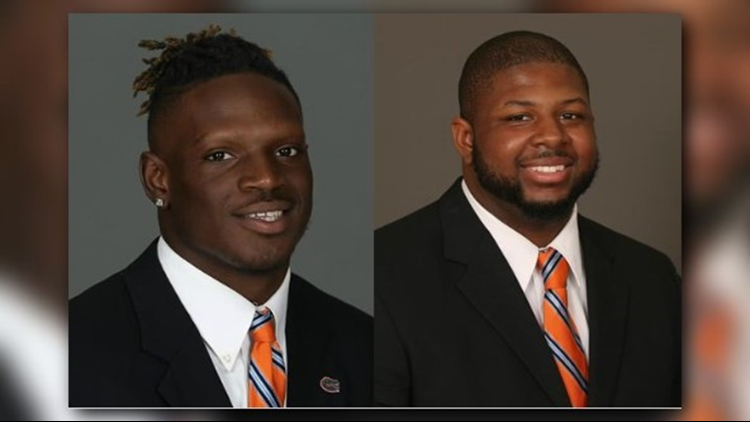 Wide receiver Kadarius Toney and defensive tackle Kyree Campbell were recommended to UF’s Student Conduct and Conflict Resolution department for an “incident by holding and pointing what appears to be assault rifles (later determined to be airsoft rifles) at other individuals on campus,” the report states. 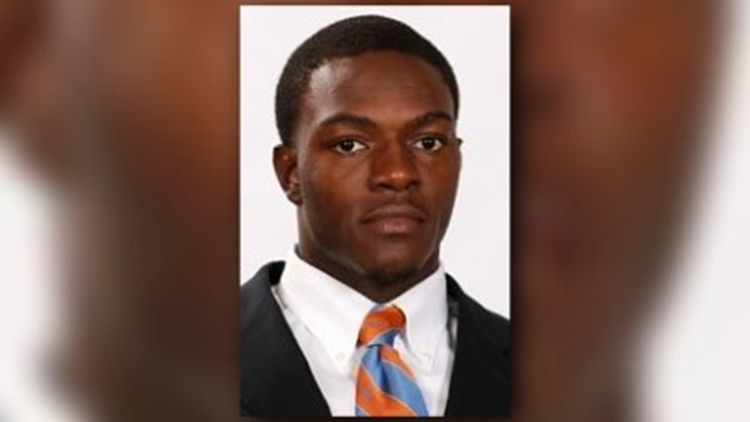 Wide receivers Tyrie Cleveland, Rick Wells, tight end Kemore Gamble and quarterback Emory Jones were also recommended to the Student Conduct and Conflict Resolution department for lying to university police about the incident in question, the report states. None of the players listed above have been charged with a crime. University police discussed with Toney how dangerous the situation could have been, as a result of using the airsoft guns that appeared real. Toney replied that other guys try and pick fights with the football players when they go out into public, the report states. Zachery was given a no trespass warning from all university property for a period of three years, the report states. After Zachery’s interview with university police, he posted on Facebook: “Damn the University of Florida got some b**** a** football players,” the report states. During the investigation, police reported inspecting the airsoft rifles. “The one rifle made to look like an AR15, which Toney was carrying, had the orange tip mostly painted black making it look even more like a real rifle,” the report states. Florida Gators Director of Student-Athlete Development Vernell Brown assured police the airsoft guns would not be seen on campus again, the report states. Firearms or Other Weapons Violations. Possession, use, sale, or distribution of any firearm, ammunition, weapon or similar device not explicitly permitted under University of Florida Regulation 2.001. Prohibited devices include, but are not limited to, stun guns, pellet guns, BB guns, paintball guns, slingshots, archery equipment, any dangerous chemical or biological agent, or any object or material, including but not limited to knives, capable of causing, and used by the offending person to cause, or to threaten physical harm. A university spokesperson declined to comment to First Coast News about this story citing student privacy laws. First Coast News also reached out to the university athletic department multiple times, but have not received a response. This is not the first incident for the UF football team this week. Freshman Justin Watkins is facing four charges, including two felonies, after his second arrest in the past three months. In 2016, Cleveland and Wells were arrested after being accused of firing BB guns on campus and causing more than a $1,000 in property damage.